Hemingway's Classic Portrait Of The Pageantry Of Bullfighting. 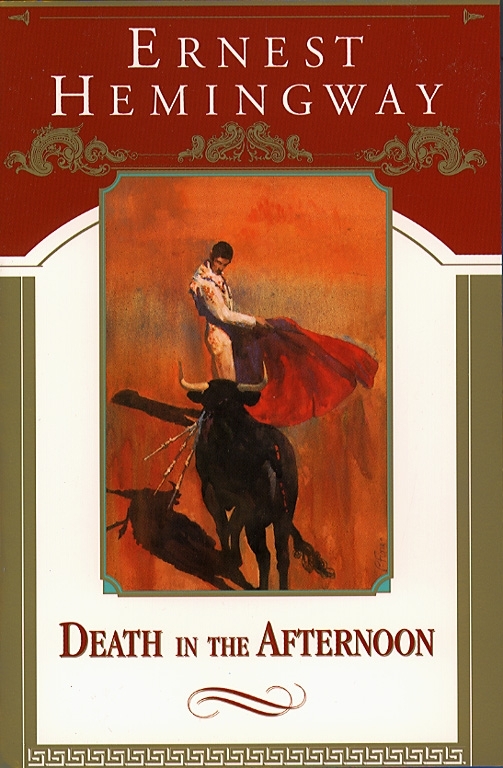 Still considered one of the best books ever written about bullfighting, Death in the Afternoon reflects Hemingway's belief that bullfighting was more than mere sport. Here he describes and explains the technical aspects of this dangerous ritual, and "the emotional and spiritual intensity and pure classic beauty that can be produced by a man, an animal, and a piece of scarlet serge draped on a stick." Seen through his eyes, bullfighting becomes an art, a richly choreographed ballet, with performers who range from awkward amateurs to masters of great grace and cunning. 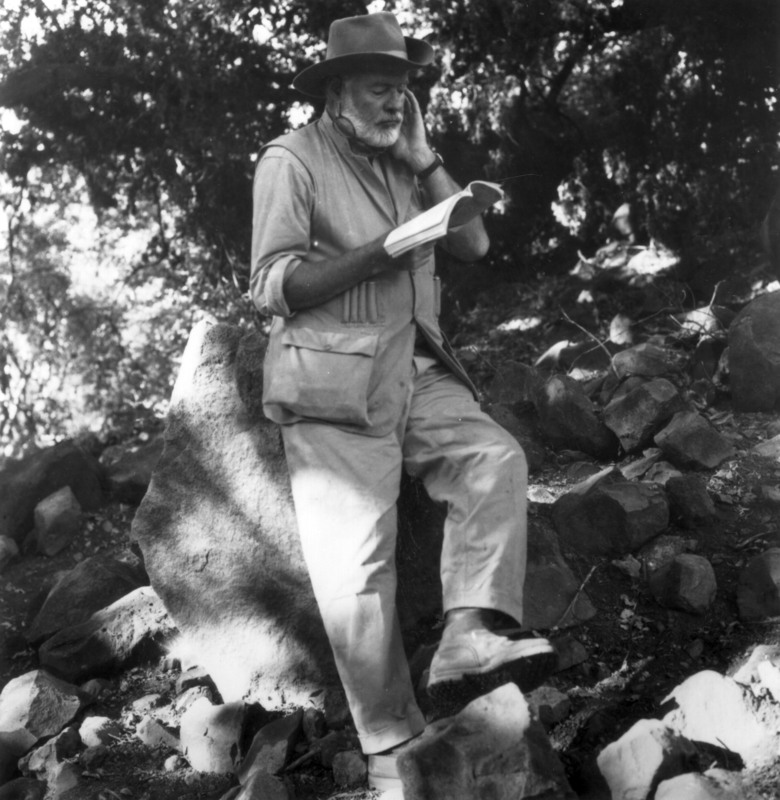 A fascinating look at the history and grandeur of bullfighting, Death in the Afternoon is also a deeper contemplation on the nature of cowardice and bravery, sport and tragedy, and is enlivened throughout by Hemingway's pungent commentary on life and literature. At the first bullfight I ever went to I expected to be horrified and perhaps sickened by what I had been told would happen to the horses. Everything I had read about the bull ring insisted on that point; most people who wrote of it condemned bullfighting outright as a stupid brutal business, but even those that spoke well of it as an exhibition of skill and as a spectacle deplored the use of the horses and were apologetic about the whole thing. The killing of the horses in the ring was considered indefensible. I suppose, from a modern moral point of view, that is, a Christian point of view, the whole bullfight is indefensible; there is certainly much cruelty, there is always danger, either sought or unlooked for, and there is always death, and I should not try to defend it now, only to tell honestly the things I have found true about it. To do this I must be altogether frank, or try to be, and if those who read this decide with disgust that it is written by some one who lacks their, the readers', fineness of feeling I can only plead that this may be true. But whoever reads this can only truly make such a judgment when he, or she, has seen the things that are spoken of and knows truly what their reactions to them would be. Once I remember Gertrude Stein talking of bullfights spoke of her admiration for Joselito and showed me some pictures of him in the ring and of herself and Alice Toklas sitting in the first row of the wooden barreras at the bull ring at Valencia with Joselito and his brother Gallo below, and I had just come from the Near East, where the Greeks broke the legs of their baggage and transport animals and drove and shoved them off the quay into the shallow water when they abandoned the city of Smyrna, and I remember saying that I did not like the bullfights because of the poor horses. I was trying to write then and I found the greatest difficulty, aside from knowing truly what you really felt, rather than what you were supposed to feel, and had been taught to feel, was to put down what really happened in action; what the actual things were which produced the emotion that you experienced. In writing for a newspaper you told what happened and, with one trick and another, you communicated the emotion aided by the element of timeliness which gives a certain emotion to any account of something that has happened on that day; but the real thing, the sequence of motion and fact which made the emotion and which would be as valid in a year or in ten years or, with luck and if you stated it purely enough, always, was beyond me and I was working very hard to try to get it. The only place where you could see life and death, i.e., violent death now that the wars were over, was in the bull ring and I wanted very much to go to Spain where I could study it. I was trying to learn to write, commencing with the simplest things, and one of the simplest things of all and the most fundamental is violent death. It has none of the complications of death by disease, or so-called natural death, or the death of a friend or some one you have loved or have hated, but it is death nevertheless, one of the subjects that a man may write of. I had read many books in which, when the author tried to convey it, he only produced a blur, and I decided that this was because either the author had never seen it clearly or at the moment of it, he had physically or mentally shut his eyes, as one might do if he saw a child that he could not possibly reach or aid, about to be struck by a train. In such a case I suppose he would probably be justified in shutting his eyes as the mere fact of the child being about to be struck by the train was all that he could convey, the actual striking would be an anti-climax, so that the moment before striking might be as far as he could represent. But in the case of an execution by a firing squad, or a hanging, this is not true, and if these very simple things were to be made permanent, as, say, Goya tried to make them in Los Desastros de la Guerra, it could not be done with any shutting of the eyes. I had seen certain things, certain simple things of this sort that I remembered, but through taking part in them, or, in other cases, having to write of them immediately after and consequently noticing the things I needed for instant recording, I had never been able to study them as a man might, for instance, study the death of his father or the hanging of some one, say, that he did not know and would not have to write of immediately after for the first edition of an afternoon newspaper. So I went to Spain to see bullfights and to try to write about them for myself. I thought they would be simple and barbarous and cruel and that I would not like them, but that I would see certain definite action which would give me the feeling of life and death that I was working for. I found the definite action; but the bullfight was so far from simple and I liked it so much that it was much too complicated for my then equipment for writing to deal with and, aside from four very short sketches, I was not able to write anything about it for five years -- and I wish I would have waited ten. However, if I had waited long enough I probably never would have written anything at all since there is a tendency when you really begin to learn something about a thing not to want to write about it but rather to keep on learning about it always and at no time, unless you are very egotistical, which, of course, accounts for many books, will you be able to say: now I know all about this and will write about it. Certainly I do not say that now; every year I know there is more to learn, but I know some things which may be interesting now, and I may be away from the bullfights for a long time and I might as well write what I know about them now. Also it might be good to have a book about bullfighting in English and a serious book on such an unmoral subject may have some value. So far, about morals, I know only that what is moral is what you feel good after and what is immoral is what you feel bad after and judged by these moral standards, which I do not defend, the bullfight is very moral to me because I feel very fine while it is going on and have a feeling of life and death and mortality and immortality, and after it is over I feel very sad but very fine. Also, I do not mind the horses; not in principle, but in fact I do not mind them. I was very surprised at this since I cannot see a horse down in the street without having it make me feel a necessity for helping the horse, and I have spread sacking, unbuckled harness and dodged shod hoofs many times and will again if they have horses on city streets in wet and icy weather, but in the bull ring I do not feel any horror or disgust whatever at what happens to the horses. I have taken many people, both men and women, to bullfights and have seen their reactions to the death and goring of horses in the ring and their reactions are quite unpredictable. Women that I felt sure would enjoy the bullfights with the exception of the goring of the horses were quite unaffected by it; I mean really unaffected, that is, something that they disapproved of and that they expected would horrify and disgust them did not disgust them or horrify them at all. Other people, both men and women, were so affected that they were made physically ill. I will go into the way some of these people acted in detail later but let me say now that there was no difference, or line of difference, so that these people could be divided by any standard of civilization or experience into those that were affected and those that were not affected. From observation I would say that people may possibly be divided into two general groups; those who, to use one of the terms of the jargon of psychology, identify themselves with, that is, place themselves in the position of, animals, and those who identify themselves with human beings. I believe, after experience and observation, that those people who identify themselves with animals, that is, the almost professional lovers of dogs, and other beasts, are capable of greater cruelty to human beings than those who do not identify themselves readily with animals. It seems as though there were a fundamental cleavage between people on this basis although people who do not identify themselves with animals may, while not loving animals in general, be capable of great affection for an individual animal, a dog, a cat, or a horse for instance. But they will base this affection on some quality of, or some association with, this individual animal rather than on the fact that it is an animal and hence worthy of love. For myself, I have felt profound affection for three different cats, four dogs, that I remember, and only two horses; that is horses that I have owned, ridden or driven. As for horses that I have followed, watched race and bet on I have had profound admiration and, when I had bet money on them, almost affection for a number of these animals; the ones that I remember best being Man of War, Exterminator, I believe I honestly had affection for him, Epinard, Kzar, Heros XII, Master Bob, and a half-bred horse, a steeplechaser like the last two, named Uncas. I had great, great admiration for all of those animals, but how much of my affection was due to the sums staked I do not know. Uncas, when he won a classic steeplechase race at Auteuil at odds of better than ten to one, carrying my money on him, I felt profound affection for. But if you should ask me what eventually happened to this animal that I was so fond of that Evan Shipman and I were nearly moved to tears when speaking of the noble beast, I would have to answer that I do not know. I do know that I do not love dogs as dogs, horses as horses, or cats as cats. The question of why the death of the horse in the bull ring is not moving, not moving to some people that is, is complicated; but the fundamental reason may be that the death of the horse tends to be comic while that of the bull is tragic. In the tragedy of the bullfight the horse is the comic character. This may be shocking, but it is true. Therefore the worse the horses are, provided they are high enough off the ground and solid enough so that the picador can perform his mission with the spiked pole, or vara, the more they are a comic element. You should be horrified and disgusted at these parodies of horses and what happens to them, but there is no way to be sure that you will be unless you make up your mind to be, no matter what your feelings. They are so unlike horses; in some ways they are like birds, any of the awkward birds such as the adjutants or the wide-billed storks, and when, lifted by the thrust of the bull's neck and shoulder muscles their legs hang, big hoofs dangling, neck drooping, the worn-out body lifted on the horn, they are not comic; but I swear they are not tragic. The tragedy is all centred in the bull and in the man. The tragic climax of the horse's career has occurred off stage at an earlier time; when he was bought by the horse contractor for use in the bull ring. The end in the ring, somehow, seems not unfitting to the structure of the animal and when the canvases are stretched over the horses, the long legs, and necks, the strange-shaped heads and the canvas covering the body to make a sort of wing, they are more like birds than ever. They look a little as a dead pelican does. A live pelican is an interesting, amusing, and sympathetic bird, though if you handle him he will give you lice; but a dead pelican looks very silly. This is not being written as an apology for bullfights, but to try to present the bullfight integrally, and to do this a number of things must be admitted which an apologist, making a case, would slide over or avoid. The comic that happens to these horses is not their death then; death is not comic, and gives a temporary dignity to the most comic characters, although this dignity passes once death has occurred; but the strange and burlesque visceral accidents which occur. There is certainly nothing comic by our standards in seeing an animal emptied of its visceral content, but if this animal instead of doing something tragic, that is, dignified, gallops in a stiff old-maidish fashion around a ring trailing the opposite of clouds of glory it is as comic when what it is trailing is real as when the Fratellinis give a burlesque of it in which the viscera are represented by rolls of bandages, sausages and other things. If one is comic the other is; the humor comes from the same principle. I have seen it, people running, horse emptying, one dignity after another being destroyed in the spattering, and trailing of its innermost values, in a complete burlesque of tragedy. I have seen these, call them disembowellings, that is the worst word, when, due to their timing, they were very funny. This is the sort of thing you should not admit, but it is because such things have not been admitted that the bullfight has never been explained. These visceral accidents, as I write this, are no longer a part of the Spanish bullfight, as under the government of Primo de Rivera it was decided to protect the abdomens of the horses with a sort of quilted mattress designed in the terms of the decree "to avoid those horrible sights which so disgust foreigners and tourists." These protectors avoid these sights and greatly decrease the number of horses killed in the bull ring, but they in no way decrease the pain suffered by the horses; they take away much of the bravery from the bull, this to be dealt with in a later chapter, and they are the first step toward the suppression of the bullfight. The bullfight is a Spanish institution; it has not existed because of the foreigners and tourists, but always in spite of them and any step to modify it to secure their approval, which it will never have, is a step toward its complete suppression. This that has been written about one person's reaction to the horses in the bull ring is not put in because of a desire of the author to write about himself and his own reactions, considering them as important and taking delight in them because they are his, but rather to establish the fact that the reactions were instant and unexpected. I did not become indifferent to the fate of the horses through the callousness of seeing a thing many times so that the emotions are no longer touched. It was not a matter of the emotions becoming insulated through familiarity. However I feel about the horses emotionally, I felt the first time I saw a bullfight. It might be argued that I had become callous through having observed war, or through journalism, but this would not explain other people who had never seen war, nor, literally, physical horror of any sort, nor ever even worked on, say, a morning newspaper, having exactly the same reactions. I believe that the tragedy of the bullfight is so well ordered and so strongly disciplined by ritual that a person feeling the whole tragedy cannot separate the minor comic-tragedy of the horse so as to feel it emotionally. If they sense the meaning and end of the whole thing even when they know nothing about it; feel that this thing they do not understand is going on, the business of the horses is nothing more than an incident. If they get no feeling of the whole tragedy naturally they will react emotionally to the most picturesque incident. Naturally, too, if they are humanitarians or animalarians (what a word!) they will get no feeling of the tragedy but only a reaction on humanitarian or animalarian grounds, and the most obviously abused thing is the horse. If they sincerely identify themselves with animals they will suffer terribly, more so perhaps than the horse; since a man who has been wounded knows that the pain of a wound does not commence until about half an hour after it has been received and there is no proportional relation in pain to the horrible aspect of the wound; the pain of an abdominal wound does not come at the time but later with the gas pains and the beginnings of peritonitis; a pulled ligament or a broken bone, though, hurts at once and terribly; but these things are not known or they are ignored by the person who has identified himself with the animal and he will suffer genuinely and terribly, seeing only this aspect of the bullfight, while, when a horse pulls up lame in a steeplechase, he will not suffer at all and consider it merely regrettable. The aficionado, or lover of the bullfight, may be said, broadly, then, to be one who has this sense of the tragedy and ritual of the fight so that the minor aspects are not important except as they relate to the whole. Either you have this or you have not, just as, without implying any comparison, you have or have not an ear for music. Without an ear for music the principle impression of an auditor at a symphony concert might be of the motions of the players of the double bass, just as the spectator at the bullfight might remember only the obvious grotesqueness of a picador. The movements of a player of the double bass are grotesque and the sounds produced are many times, if heard by themselves, meaningless. If the auditor at a symphony concert were a humanitarian as he might be at the bullfight he would probably find as much scope for his good work in ameliorating the wages and living conditions of the players of the double bass in symphony orchestras as in doing something about the poor horses. However, being, let us suppose, a man of culture and knowing that symphony orchestras are wholly good and to be accepted in their entirety he probably has no reactions at all except pleasure and approval. He does not think of the double bass as separated from the whole of the orchestra or as being played by a human being. As in all arts the enjoyment increases with the knowledge of the art, but people will know the first time they go, if they go open-mindedly and only feel those things they actually feel and not the things they think they should feel, whether they will care for the bullfights or not. They may not care for them at all, no matter whether the fight should be good or bad, and all explanation will be meaningless beside the obvious moral wrongness of the bullfight, just as people could refuse to drink wine which they might enjoy because they did not believe it right to do so. The comparison with wine drinking is not so far-fetched as it might seem. Wine is one of the most civilized things in the world and one of the natural things of the world that has been brought to the greatest perfection, and it offers a greater range for enjoyment and appreciation than, possibly, any other purely sensory thing which may be purchased. One can learn about wines and pursue the education of one's palate with great enjoyment all of a lifetime, the palate becoming more educated and capable of appreciation and you having constantly increasing enjoyment and appreciation of wine even though the kidneys may weaken, the big toe become painful, the finger joints stiffen, until finally, just when you love it the most you are finally forbidden wine entirely. Just as the eye which is only a good healthy instrument to start with becomes, even though it is no longer so strong and is weakened and worn by excesses, capable of transmitting constantly greater enjoyment to the brain because of the knowledge or ability to see that it has acquired. Our bodies all wear out in some way and we die, and I would rather have a palate that will give me the pleasure of enjoying completely a Chateaux Margaux or a Haut Brion, even though excesses indulged in in the acquiring of it has brought a liver that will not allow me to drink Richebourg, Corton, or Chambertin, than to have the corrugated iron internals of my boyhood when all red wines were bitter except port and drinking was the process of getting down enough of anything to make you feel reckless. The thing, of course, is to avoid having to give up wine entirely just as, with the eye, it is to avoid going blind. But there seems to be much luck in all these things and no man can avoid death by honest effort nor say what use any part of his body will bear until he tries it. This seems to have gotten away from bullfighting, but the point was that a person with increasing knowledge and sensory education may derive infinite enjoyment from wine, as a man's enjoyment of the bullfight might grow to become one of his greatest minor passions, yet a person drinking, not tasting or savoring but drinking, wine for the first time will know, although he may not care to taste or be able to taste, whether he likes the effect or not and whether or not it is good for him. In wine, most people at the start prefer sweet vintages, Sauternes, Graves, Barsac, and sparkling wines, such as not too dry champagne and sparkling Burgundy because of their picturesque quality while later they would trade all these for a light but full and fine example of the Grand crus of Medoc though it may be in a plain bottle without label, dust, or cobwebs, with nothing picturesque, but only its honesty and delicacy and the light body of it on your tongue, cool in your mouth and warm when you have drunk it. So in bullfighting, at the start it is the picturesqueness of the paseo, the color, the scene, the picturesqueness of farols and molinetes, the bullfighter putting his hand on the muzzle of the bull, stroking the horns, and all such useless and romantic things that the spectators like. They are glad to see the horses protected if it saves them from awkward sights and they applaud all such moves. Finally, when they have learned to appreciate values through experience what they seek is honesty and true, not tricked, emotion and always classicism and the purity of execution of all the suertes, and, as in the change in taste for wines, they want no sweetening but prefer to see the horses with no protection worn so that all wounds may be seen and death given rather than suffering caused by something designed to allow the horses to suffer while their suffering is spared the spectator. But, as with wine, you will know when you first try it whether you like it as a thing or not from the effect it will have on you. There are forms of it to appeal to all tastes and if you do not like it, none of it, nor, as a whole, while not caring for details, then it is not for you. It would be pleasant of course for those who do like it if those who do not would not feel that they had to go to war against it or give money to try to suppress it, since it offends them or does not please them, but that is too much to expect and anything capable of arousing passion in its favor will surely raise as much passion against it. The chances are that the first bullfight any spectator attends may not be a good one artistically; for that to happen there must be good bullfighters and good bulls; artist bullfighters and poor bulls do not make interesting fights, for the bullfighter who has ability to do extraordinary things with the bull which are capable of producing the intensest degree of emotion in the spectator will not attempt them with a bull which he cannot depend on to charge; so, if the bulls are bad, that is only vicious rather than brave, undependable in their charges, reserved and unpredictable in their attacks, it is best that they be fought by bullfighters with knowledge of their profession, integrity, and years of experience rather than artistic ability. Such bullfighters will give a competent performance with a difficult animal, and because of the extra danger from the bull and the skill and courage they must use to overcome this danger, to prepare for the killing and kill with any degree of dignity, the bullfight is interesting, even to a person who has never seen one before. However, if such a bullfighter, skillful, knowing, brave and competent but without either genius or great inspiration happens to receive in the ring a truly brave bull, one which charges in a straight line, which responds to all the cites of the bullfighter, which grows braver under punishment, and has that technical quality that the Spanish call "nobility" and the bullfighter has only bravery and honest ability in the preparation for killing and killing of bulls and nothing of the wrist magic and aesthetic vision that, given a bull that will charge in a straight line, has produced the sculptural art of modern bullfighting; then he fails completely, he gives an undistinguished, honest performance and he goes on lower down in the commercial ranking of bullfighting while men in the crowd who earn, perhaps, less than a thousand pesetas a year will say, and mean it truly, "I would have given a hundred pesetas to have seen Cagancho with that bull." Cagancho is a gypsy, subject to fits of cowardice, altogether without integrity, who violates all the rules, written and unwritten, for the conduct of a matador but who, when he receives a bull that he has confidence in, and he has confidence in them very rarely, can do things which all bullfighters do in a way they have never been done before and sometimes standing absolutely straight with his feet still, planted as though he were a tree, with the arrogance and grace that gypsies have and of which all other arrogance and grace seems an imitation, moves the cape spread full as the pulling jib of a yacht before the bull's muzzle so slowly that the art of bullfighting, which is only kept from being one of the major arts because it is impermanent, in the arrogant slowness of his veronicas becomes, for the seeming minutes that they endure, permanent. That is the worst sort of flowery writing, but it is necessary to try to give the feeling, and to some one who has never seen it a simple statement of the method does not convey the feeling. Any one who has seen bullfights can skip such flowerishness and read the facts which are much more difficult to isolate and state. The fact is that the gypsy, Cagancho, can sometimes, through the marvellous wrists that he has, perform the usual movements of bullfighting so slowly that they become, to old-time bullfighting, as the slow motion picture is to the ordinary motion picture. It is as though a diver could control his speed in the air and prolong the vision of a swan dive, which is a jerk in actual life, although in photographs it seems a long glide, to make it a long glide like the dives and leaps we sometimes take in dreams. Other bullfighters who have or have had this ability with their wrists are Juan Belmonte and, occasionally with the cape, Enrique Torres and Felix Rodriguez. The spectator going to a bullfight for the first time cannot expect to see the combination of the ideal bull and the ideal fighter for that bull which may occur not more than twenty times in all Spain in a season and it would be wrong for him to see that the first time. He would be so confused, visually, by the many things he was seeing that he could not take it all in with his eyes, and something which he might never see again in his life would mean no more to him than a regular performance. If there is any chance of his liking the bullfights the best bullfight for him to see first is an average one, two brave bulls out of six, the four undistinguished ones to give relief to the performance of the two excellent ones, three bullfighters, not too highly paid, so that whatever extraordinary things they do will look difficult rather than easy, a seat not too near the ring so that he will see the entire spectacle rather than, if he is too close, have it constantly broken up into bull and horse, man and bull, bull and man -- and a hot sunny day. The sun is very important. The theory, practice and spectacle of bullfighting have all been built on the assumption of the presence of the sun and when it does not shine over a third of the bullfight is missing. The Spanish say, "El sol es el mejor torero." The sun is the best bullfighter, and without the sun the best bullfighter is not there. He is like a man without a shadow.